Caroline Alexander - Mrs. Chippy's last expedition. 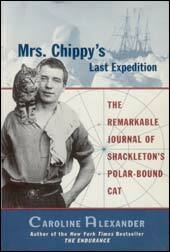 When Sir Ernest Shackleton's ship Endurance became trapped in the Antarctic ice, all twenty-nine members of the crew were pushed to their limits of survival, including Mrs. Chippy, the ship's estimable cat. Fortunately for posterity, Mrs. Chippy left a diary of the ordeal. Closely based on the true events of Shackleton's heroic journey, and illustrated with authentic photographs taken by Frank Hurley, expedition photographer, Mrs. Chippy's Last Expedition is a firsthand account of one of the greatest adventures in history - from a unique point of view.